Amazon Virtual Private Cloud (Amazon VPC) lets you provision a logically-isolated section of the Amazon Web Services (AWS) cloud where you can launch AWS resources in a virtual network that you define. You have complete control over your virtual networking environment, including selection of your IP address range, creation of subnets, and configuration of route tables and network gateways. You can easily customize the network configuration for your Amazon VPC. For example, you can create a public-facing subnet for your web servers that has access to the internet, and place your backend systems, such as databases or application servers, in a private-facing subnet with no internet access. You can leverage multiple layers of security, including security groups and network access control lists (ACLs), to help control access to Amazon EC2 instances in each subnet. To review the VPC features, go to the left navigation pane and select Security > Secure Configuration > VPC. The VPC Summary report provides a high-level overview of all of the VPC traffic associated with your account. This page has summary and detail tables on your VPC. The list of VPCs report provides a filter so you can search the entire inventory of VPCs associated with your AWS account. The traffic analysis report provides details on the gateways that permit traffic to move through to your VPC. Traffic to a VPC flows from an internet gateway or virtual private gateway. As traffic enters the VPC, it passes through a routing table and is filtered by a network ACL before entering a subnet. Once into the subnet, the traffic is verified by VPC security groups before reaching a resource (such as an EC2 instance). CloudCheckr also provides information on the route tables and subnets associated with your VPCs. The Traffic Analysis report allows you to filter by region and VPC ID. This report helps you build a common search. Click here for more information on how to use this report. Type any parameters if applicable. The List of Network ACLs report, with all the appropriate filters, will open. From the List of Network ACLs report, modify your search. Summary: a summary of the subnets associated with your AWS account that includes charts with your subnets by region and by VPC. 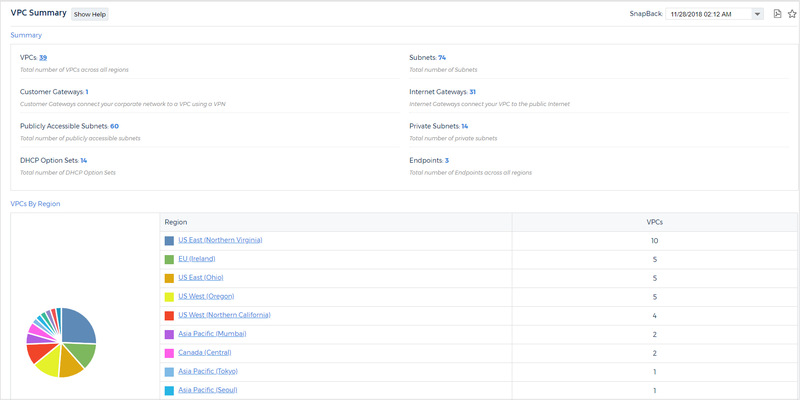 List of Subnets: a detail report of subnets associated with your AWS account that allows you to filter by availability zone, region, state, subnet ID, tag, or VPC. Summary: the ACL summary report is a high-level summary of all the ACL activity associated with your AWS account that includes the number of network ACL outbound rules, the inbound rules, and a chart for network ACLs by region and by VPC. List of ACL: the list of ACLs report provides information on every ACL associated with your AWS account, and allows you to filter information by parameters such as protocol list, region, VPC, and more.